To fully understand the insignificance of the New Bus For London, try catching one. It took me three attempts. The first time I waited in vain for over an hour. I stood at a random bus stop in the West End while at least sixty bog-standard 38s drove by, but there was no sign of the legendary New Bus. The second time I checked the temporary timetable and went instead to Islington. Here I waited for over half an hour while dozens of ordinary buses passed, but still not the elusive New Bus. The third time I consulted the timetable more carefully, headed to the start of the route in Hackney, and my patience was rewarded. But take note - with 8000 red buses on the streets of London, and only one of them so far special, your chances of accidentally riding the New Bus are minimal at best. Here it was at last, turning the corner into Graham Road from the opposite direction to normal. A red bus of a most unfamiliar shape, its headlamps blazing an unnatural white, drew silently towards its first stop. A collective smirk crossed the faces of the waiting crowd. They hadn't turned up specially, they were merely heading into town, and the arrival of London's newest transport superstar was an unexpected bonus. The New Bus may have three doorways, but everybody instinctively rushed for the front. 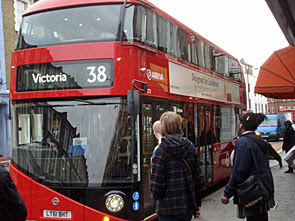 That's what people expect on London buses these days - always enter by the driver - so it'll probably take a while for the New Bus's rear platform to register and catch on. Once inside, every face beamed wider. Most passengers plumped for a seat in the upper saloon, but I thought I'd stay downstairs to keep an eye on comings and goings. Our young Conductor, or whatever his official title is, stood in the recess where the cupboard under the rear stairs ought to be. His main job appeared to be to smile, which he did very well, and to engage the nearby passengers in conversation. The four rear seats on the ground floor face backwards, so they're the ideal place to sit if you fancy a bit of banter with the Rear Platform Operative. "What do you think of the bus?" he asked, to collectively positive responses. "The platform'll stay open until about 8 in the evening," he added - news which didn't appear to upset the daytime clientèle too much. A fair few Hackney schoolkids were about, in a variety of brightly-coloured uniforms depending on their Academy status. They grinned on boarding, with a "wow!" or a "this is so cool!" before disappearing upstairs. A pair of junior school scallies worked out they could do a circuit of the bus by heading up one staircase and down the other, but were thwarted in their progress by static adults blocking the lower gangway. Three girl friends at the next bus stop pointed, giggled and snapped a photo of the New Bus on their phone to share later. A sixth-former with jawline beard took up position in the wheelchair space, looked around his unfamiliar surroundings, smiled contentedly and went back to his last minute revision. It's a winner with the younger generation, all round, already. The New Bus's disembodied voice doesn't only announce the name of the next stop, it also provides intermittent health and safety guidance. 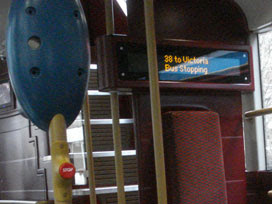 "Watch out for traffic when leaving the bus" it warns - advice which also scrolls repeatedly across the red electronic display screen. But only once in the entire journey did Staff Member Number Two earn his keep by adding instructions of his own; "Stay inside the bus please, thanks." As expected, every passenger seemed perfectly capable of boarding and alighting via the rear platform unaided, without unintentionally stumbling to their death. But legislation demands salaried supervision at all times, it seems, because 21st century freedom comes at a cost. At every bus stop, the New Bus drew admiring glances. Those fortunate enough to be waiting for a 38 streamed on, filling the seats, to join the love-in. One rang a friend to tell them the good news: "I'm on the Routemaster!" (although they weren't, they'd simply been sucked in by the publicity). Meanwhile those who wanted different bus routes were left standing on the pavement, mouths collectively agape... which could have been mass yawning but was more likely genuine admiration. I could see this even more clearly from upstairs - repeated delight on seeing the New Bus, the mobiles whipped out to take a photo, several unmistakeable expressions of pride - as our non-cuboid inaugural vehicle slid by. There was condensation on the front window, even though weather conditions didn't seem to merit it. The upper air conditioning hissed relentlessly, like niggling mechanical tinnitus. 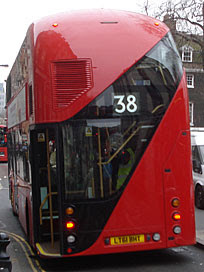 It was impossible to see out of the back window because the bus's iconic design prevents it. The ceiling was a bit low for anyone tall getting up from an upstairs window seat. Rather too many of the downstairs seats require you to face backwards, or to step up before sitting down, or both. But nobody noticed any of this, neither those on the bus nor those watching it pass. All they saw was a gorgeous modern vehicle with a human face, and a Routemaster-like rear platform for hopping off between stops, and a Mayoral promise made instantly real. To fully understand the significance of the New Bus For London, watch the happy faces of the voters who've ridden it.